JEE Advanced 2019 Counselling: The counselling of JEE Advanced 2019 will be conducted by JoSAA. Only the eligible and qualified candidates will participate in JEE Advanced 2019 Counselling. Candidates can check the full details like JEE Advanced 2019 counselling dates here. The steps involved in JEE Advanced counselling 2019 have been given here. Candidates must go to the JoSAA official website to registed for the online counselling. The Counselling and seat allotment procedure for JEE Advanced 2019 will be carried out by the Joint Seat Allocation Authority better known as JoSAA. All the eligible candidates will be required to participate in the counselling process and fill the choices of course. The detailed instructions for filling-in the choices and the seat allotment procedure will be made available by JoSAA through Seat Allotment Brochure. Admission will be given to candidates based on the category they belong to and provided they satisfy the minimum eligibility norms and have not accepted a seat in the preparatory course earlier. To participate in JEE Advanced 2019 counselling, candidates need to have secured the acceptable rank in JEE Advanced 2019. For admission to IITs, the candidate must be within the top 20 percentile of successful candidates in class 12th or equivalent board exam. Click on the registration Link (the link will be provided here as soon as it is released). Enter your JEE Advanced 2019 Admit card number, registration Number and date of birth (as given on JEE Advanced 2019 admit card). 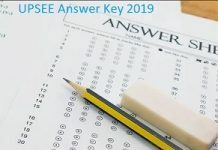 Log in using your user ID, JEE Advanced 2019 roll number and password. Fill in your choice according to the preference of branches and institutes. Make changes in terms of editing, reordering their choices and add new choices till the final locking. Candidates must lock the choices before the last date or else the choices entered will be locked by default. The participating candidates will be allotted seats for admission to IITs. Seat allotment will be held in 7 rounds. Candidates must check the seats allotted at the end of every round of counselling. To check the allotted seat, candidates will be required to log in using the login credentials. Candidates will also be able to download the e-challan too which will be required to pay the acceptance fee. The online seat allotment procedure will also require the candidate to get a soft copy of all his/her certificates. Candidates belonging to the reserved categories have to pay Rs.20,000 and those belonging to the general categories have to pay Rs.45,000. Fees can be paid through SBI Net banking and e-challan. To provisionally freeze the seat allotted, the candidate will be required to pay the requisite tuition fee. JEE Advanced 2019 seat allotment letter from JoSAA. JEE Advanced 2019 original Admit Card. JEE Advanced 2019 filled in Application form. For foreign nationals: Attested photocopy of the page in the passport containing name, photo and nationality.